John Smyrnaios was from Piraeus and born in 1903. His father was a shipbuilder from Ermoupoli in Syros, and his mother was from the island of Hydra. At the age of two he was orphaned and was raised by his grandmother in the fear of God and piety. He was well educated and graduated from the School of Law of the University of Athens. Though highly educated, he always took care of his spiritual life as well. For this reason his fellow students called him "spiritually minded", and his teachers admired his diligence and consistency. They even wanted to promote his academic career as a prominent scientist. From a young age John had a unique soul. He was gentle, cheerful, lenient, willing to help those in need and even without demonstration. He was moderate, humble and loyal. At the same time, he took advantage of his time to study the Divine Scriptures, which he studied night and day after prayer. Prayer he considered food for the soul and enjoyed it without hurry, with peace and attention to his words, having a humbled look of sinfulness before the heavenly King. 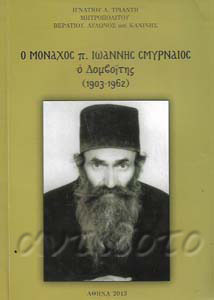 Living in this way, he, with the blessing of his spiritual fathers Metropolitan George of Kalavryta and Aegialia, the Venerable Hieronymos of Simonopetra, and Father Konstantinos Paraskevas from the Church of Agios Ioannis Rentis in Piraeus, ascended the ladder of heavenly virtues. Thus divine love ate at him and removed him from relatives and friends and from the bustling harbor of Piraeus. He would confess regularly to Father Konstantinos, even after he became a monk, and once foretold to him that he would undergo a certain illness. The admiration of Father Konstantinos for John reached its peak however when John told him with his own lips how he received the Divine Eucharist from a Holy Angel. Originally he went to live a monastic life at the Monastery of the Venerable Meletios at the foothills of Kithairon, near Oinoi, on the border of the prefectures of Attica and Boeotia. He presented himself to the abbot as an illiterate porter. This is why he was assigned the obedience of being a shepherd and a collector of wood from the forest. Having become distinguished for his humble mind, however, he secretly left the monastery when his identity was revealed, and he went to the Monastery of the Venerable Seraphim in Domvous, where he lived as a recluse for the rest of his life. 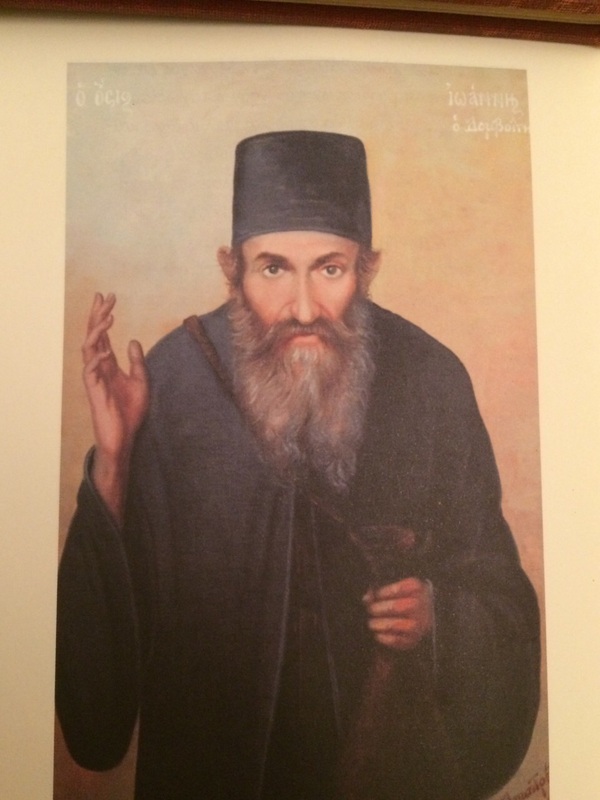 There he secretly cultivated the virtues by mortifying the flesh and he lived in uninterrupted prayer, which was accompanied with the writing of the Poems of the Monk (Ποιημάτων του Καλόγερου), which were published after his repose in three volumes by the Metropolis of Thebes. He avoided encounters with other people, living by the slogan "Be benefited, or benefit others, or leave," but he was always graceful. On the 8th of September in 1943 John received the angelic schema. In his narrow cell near the bell tower, he lived simply, and when he wrote he did so at the windowsill of his window while standing. His only belongings were two cans, which he named "the golden and silver cups". He barely ate, kept vigil like no other, and he had the habit every night at the same time to go to the church of the monastery and kiss its door, no matter what the weather conditions were like outside. His fireplace was rarely lit, and on cold nights he would rub his hands over the warm fire. On the black pot of his fireplace he even wrote in chalk: "The monk does not want talking." Living in this manner, John acquired the gift of tears, and from his constant prostrations his hands and knees were callous, as well as his forehead. He impressed everyone by his devoutness at the reading of the Psalms and the Prophets during the church services. His chanting was melodious and he never was seen sitting during even the long vigils. The poetry of John was an expression of his inner world, his deep faith and reverence. Whenever he had to go to Athens or to Piraeus for some necessity, he always did so by taking the shortest route possible and always kept his head down, never looking at people, or stores or being distracted by any spectacles. On the the 1st of June in 1962 the Venerable John reposed during the reading of Compline, as soon as he completed saying the Symbol of Faith. He lifted up his hands as if he saw somebody and with a wide smile he departed to the Lord.